Reaching out to wireless influencers, we discovered three main areas or focus for business owners who offer, or want to offer free WiFi: security, speed and management. Here’s what they had to say. That’s becoming an increasingly common question for small business owners. And with good reason. Studies show businesses see a 72% success rate in increased sales after implementing free WiFi. Accenture reports that 64% of consumers make a restaurant decision based on WiFi availability. Meeting customers’ expectations of blazing fast free WiFi, and keeping your business safe don’t have to be mutually exclusive. According to a dozen experts we consulted, there are a host of best practices and practical considerations that will get small business customers online safely, while protecting data and identities belonging to both parties — customers and businesses. And it’s not just free WiFi that’s expected; customers expect fast and reliable WiFi as well. Offering slow, glitchy WiFi can be worse than no WiFi at all. Installing a reliable business network can turn out to be a difficult task that could trip up small business owners. They’re concerned about cyber security risks and lack of control. And there’s the possibility that network administration can take away from their core mission — like selling coffee, or sandwiches — and reflect poorly on their company. Separate networks for administration and public consumption was echoed by several of the experts. “Free WiFi needs to be completely segregated from the company’s network,” says IDTheftSecurity.com Robert Siciliano, CEO. Slow speeds and other glitches in the user experience can reflect badly on the business — almost a “no good deed goes unpunished” scenario. The user experience is key. “The biggest challenges and glitches I see for SMB’s offering free WiFi are customers who can’t connect or when they do connect can’t get past the captive portal system (the WiFi landing page) to enjoy the Internet,” says technology content consultant David Geer. Rivalling speed for importance to small businesses offering free WiFi is security. From passwords to data protection to guarding against third-party attacks, here are some pointers from our influencers. System administrator and popular blogger and YouTuber known as Jessassin emphasizes passwords. “One thing I see done incorrectly on public wireless is not having a passcode. Password protection should be considered a critical part of any network rollout. 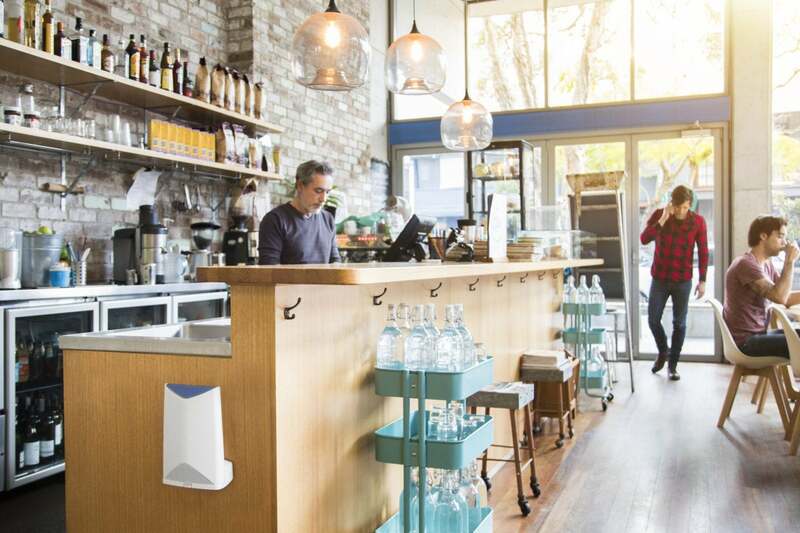 Small business WiFi is here to stay, and growing. The WiFi Alliance® reports that with more than “3 billion WiFi device shipments expected in 2017 and more than 8 billion devices currently in use around the world,” WiFi is playing a more prominent role in the expanding communications infrastructure, including consumers’ expectations of free, secure and fast access from small businesses.